BowFlex TreadClimber TC200 Review by Industry Experts! The Bowflex TC200 Is On Sale! We recently spoke with several of Bowflex’s top engineers during and interview. It was our goal to hear about some of their latest innovations and see what is on the horizon for this well-known brand. The BowFlex TreadClimber TC200 is their premium model designed to efficiently burn calories. In addition to being slightly bigger and heavier than the TreadClimber TC100, the TC200 comes with upgraded programming that is designed to assist you in achieving your fitness goals. For those who are unfamiliar with the TreadClimber concept, they are designed to be a hybrid between a treadmill, stair stepper, and an elliptical trainer. The company claims that their patented designed allows you to get a low impact workout that is more efficient than a treadmill. With their customer satisfaction history, there definitely is some basis to the claims. 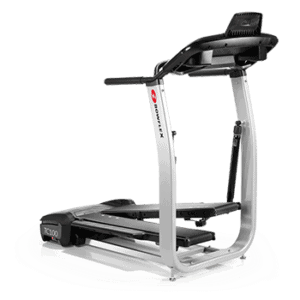 The BowFlex TreadClimber TC200 is designed with dual “treadles”. They are like mini treadmill belts for both feet. As you walk, the “treadles” move up and down to meet your feet, thus avoiding much of the impact that comes from working out on a treadmill. The TreadClimber is primarily designed for walking and is impractical for running. However, the design provides you with a workout that can be equivalent to the intensity of running. If you visit the web site or have watched their infomercials, BowFlex claims their TreadClimbers are almost 4x more efficient in burning calories in comparison to a treadmill, however, the comparison is based at walking at 3 mph with the treadmill at a zero incline. Obviously, if you crank up the incline of a treadmill you will burn considerably more calories. Still, the BowFlex TreadClimber TC200 probably will burn more calories with a lesser perceived rate of exertion based on the design. There is definitely less impact in comparison to a treadmill. Set, monitor, and track your personal fitness goals. 5 Programs: Just walk, calorie goal, distance goal, time goal, and intervals. Longer foot “Treadles” allowing you to position your feet where they are most comfortable. Compact Design – The length is only 55″. Wireless heart rate monitor, allowing you to optimize your workout based on your heart rate. This is a technique used by professional athletes. Store and track two user stats. 217 lb unit weight, giving the machine a solid and stable feel. 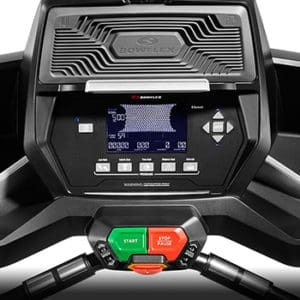 Bowflex Treadclimber TC100 – Read our full review here. The Bowflex TC200 offers the low impact and efficient workout inherent in the design of all TreadClimbers. In addition, it is equipped with programming to motivate you to reach your fitness goals and to track your progress. Many people wonder how this machine stacks up against an Incline Trainer like the NordicTrack x11i. We wrote a comparison article for you to read here. In regards to the efficiency claims made by Bowflex, remember, the most efficient machine is the one you are going to use. 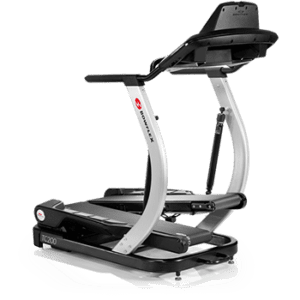 If you suffer from the impact of a treadmill and you are not comfortable with an elliptical, then the Bowflex TreadClimber TC200 may be the solution. The uphill walking motion of the TreadClimbers will definitely burn calories if you push yourself. Also, read out review on the Bowflex Treadclimber 100 and popular HIIT machines, the Bowflex MaxTrainers.